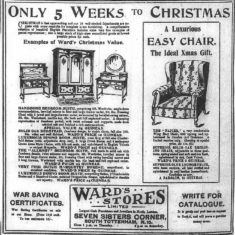 December was a month for Christmas and Politics 100 years ago. 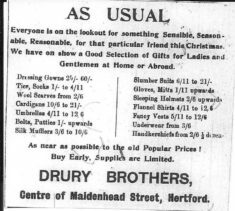 The Hertfordshire Mercury contained advertisements with ideas for presents including the “useful” such as hot water bottles; “sensible”, scarves and underwear and some more frivolous with scent bottles and pendants on the list. Although the Armistice had been signed, rationing was still in place and there was a shortage of some goods. 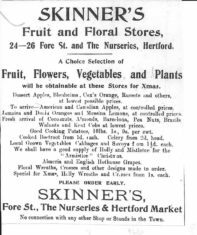 Skinner’s Stores had wide range of fruit, vegetables and decorations available. Some items, such as the apples from America and Canada were to be available “at controlled prices”; other imports, for example the Brazil nuts were to be available “at the lowest possible prices”. However, domestic produce was priced with cooked beetroot at a 1d. apiece and celery from 2d. a head. The Hertfordshire Mercury also reported festivities at Hertford Workhouse and the County Hospital. Miss Faudell-Phillips of Balls Park and Mrs Theodore Barclay of Fanshaws visited and distributed gifts to the inmates of the workhouse. The officers also received a “useful” present. Christmas dinner consisted of roast pork and turkey with two vegetables, Christmas pudding (wartime), ale and coffee. In the afternoon, gifts were distributed, selections on the gramophone played and after a substantial tea an impromptu concert held. At the County hospital there was a programme of music and songs organised by the supporters of the hospital following a turkey dinner. The festive season coincided with a general election with voting taking place on 14 December 1918. This was the first after the extension of the franchise allowing all men over the age of 21 and some women over the age of 30 a vote. In Hoddesdon, it was noted that the first to cast a vote was a woman and many turned up, some of whom were eager to tell who they had voted for and anxious to know that they had done it correctly. Sadly, in Hitchin, Mrs Anne Day, a widow aged 79, cast her vote and was immediately taken ill and died. A recurring theme throughout the county was one of apathy. In Stanstead Abbots only 393 of the 620 on the list recorded their vote. In Hitchin some 60% voted and in Much Hadham just 40%. The Hertfordshire Mercury recorded that women had made the effort to vote, in spite of the wet and miserable weather and knew exactly who they were voting for (and why) without any tuition from their male friends. The count was delayed until 28 December to accommodate those still in the Armed Forces. (Names from the Absent Voters list have been placed on Hertfordshire Names On-line (Miscellaneous category) – link here). Although Noel Pemberton Billing beat the coalition candidate to remain MP for Hertford, the result was a landslide victory for the coalition government of David Lloyd George. This page was added on 19/12/2018.